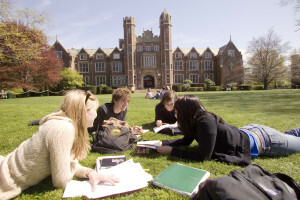 Home › FAQ › What Expenses Other Than Tuition and Housing are Common in College? What Expenses Other Than Tuition and Housing are Common in College? Many expenses other than tuition and housing are common in college, and when you take a look at your itemized receipt for payments made to your school, you will see many charges for services other than course tuition. For example, students typically pay for services like gym memberships, student center privileges and other miscellaneous amenities as mandatory costs of enrollment. Aside from these charges, there are normal costs of living while in school, and you can keep these to a minimum by following a few simple money-saving rules. One of the biggest expenses after tuition and housing is the cost of textbooks, and you can save hundreds of dollars by finding books online or in used bookstores, according to the New York Times. The cheapest textbooks come in e-book format and can often be found for free by doing a Google search. Of course, it’s illegal to download textbooks from peer-to-peer sources like BitTorrent if the copyright owner hasn’t approved the sharing, and you can easily wind up with a lawsuit by illegally downloading copyrighted content. However, many course e-books are legally available to download from Google Books and other websites. Another way to save hundreds of dollars on textbooks is to rent them in e-book format if you can’t find them for free. Renting course e-books gives you a license to use the book for four to six months, and you can typically print all or most of the pages in the book during this time. It’s not as nice as having a hardcover version of the textbook, but it usually costs around $35 to rent a textbook for a semester. In comparison, the same textbook might cost $100 to purchase from the bookstore and be worth very little when you sell it after the semester. Another big expense is transportation, and it seems like most people consider this expense unavoidable, because owning a car allows them to have a social life and get across town any time they wish. If you can’t live without a car, it’s understandable, but you can save a significant amount of money on gas and insurance by riding a bike or the bus. Another benefit of riding a bike everywhere is that you’ll get so much exercise that you won’t need to go to the gym. Most universities are located near grocery stores and retail centers, so unless you live very far from your school, it shouldn’t be too hard to make the switch to riding a bike. It’s not for everyone, but it’s an excellent way to save money. The last big expense that many students don’t consider is the technology and software they use for school. You can get discounts on software at the university bookstore or electronics store. When planning your budget for school, don’t forget all the lifestyle expenses and costs of living that go along with enrollment. If you haven’t been to college before, or haven’t been for a long time, consider which expenses other than tuition and housing are common in college.